There are many people who are allergic with mathematics, but most of the time, mathematics appears incognito in places where we don’t expect them to be. One perfect example is the Microsoft Office Package.We know the MS Excel is dedicated to mathematical computations, but what about MS Word or PowerPoint? Can we find mathematics in both applications? Enumerated below are the mathematics hidden in Microsoft Office. Regarding the mathematics found in MS Excel, we will discuss more about them in later tutorials. 1. Equations (Word). 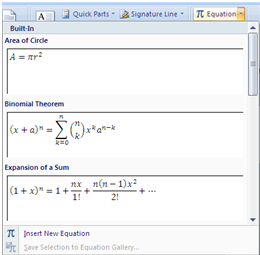 In the Insert menu of MS Word, you can see the Equation icon located at the extreme right hand side of the toolbar. This contains several built-in mathematical equations and formulas such as area of the circle and binomial theorem.